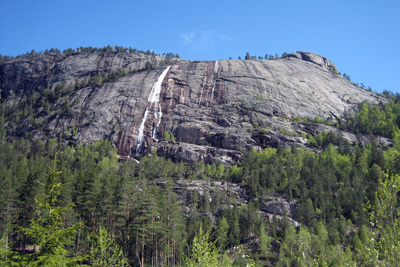 If you like multi-pitch rock climbing on solid granite slabs there is one place you have to visit: Nissedalen (~Valley of Fairies) in Norway! Most routes are traditional but you will also find modern mixed or fully bolted routes. 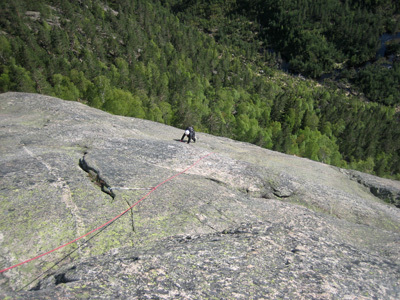 However, be prepared for a bit of adventure compared to your favorite sports climbing crag as routes often involve run-outs (even on the bolted routes) and long approaches and/or walk-offs! 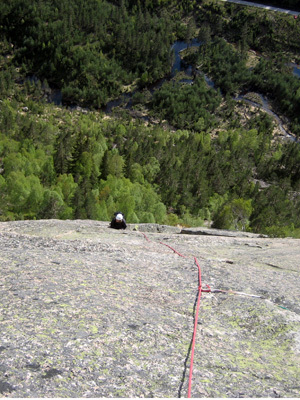 There are several rock faces in the area but the most famous is undoubtedly Hägefjell which is the highest wall (typically ~ 10 pitches) with many routes in all grades. In May 2006 I went there with my wife Elvira for a prolonged holiday weekend. Given that we had not climbed in the area before we wanted to start out with something less committing than Hägefjell in order to test our slab climbing technique and the local grade level before we climbed the big rock! We thus ran through the guide and sat our eyes on the route Just for Fun on Trollhaugen, which should be an easy grade 4. The Trollhaugen seen from the road. The route "Just For Fun" is on the dry slab on the right. At that time, the topo consisted of quite rudimentary drawings (a new guide was printed later in 2006) which was not easy to follow for a novice in the area. We thus spend a while looking through a set of binoculars from the road in order to spot the start of the route and the best approach through the forest/wetland/river! 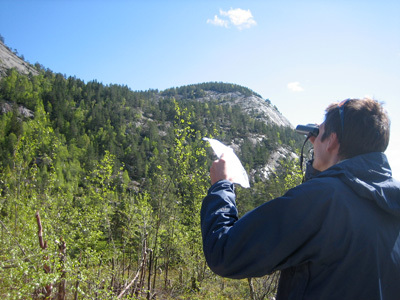 Hans comparing the topo with the rock face through a set of binoculars. The rudimentary description and drawing in the topo was not easy to follow! It was early in the season and as seen above there was still a lot of water coming down the slab. Thus the river was quite full and the wetlands quite wet! We had not thought of bringing sandals and we thus ended up walking barefooted through the low-laying wet stuff (rather yuckier!) until we finally gained higher dry ground at the foot of the rock face. Hans on the barefooted approach! However, our trouble didn't end there as it was difficult to see any landmarks on the rock face standing right below it! We thus walked around for a while looking for a the start of the route until we ran into two women which were about to climb the same route. Albeit their starting point looked wrong, we assumed that they knew what they were doing given they were Norwegians (!) and we thus followed their lead, which turned out to be a mistake! When will I learn to follow my own intuition!? The wrong start of the route! 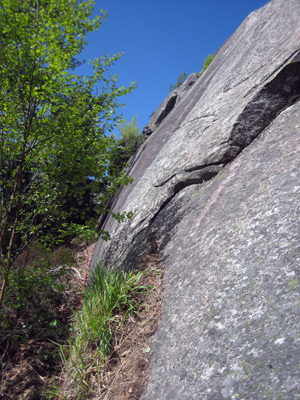 Hans has climbed up the dirt ledge (red rope visible) and his black backpack is just visible between the tree and rock overhang where he is negotiating a "hard-to-protect" slab. Anyway, after one pitch a hairy climbing, we got to the right starting point on a ledge further up (which we could have gained further to the right of our wrong start). 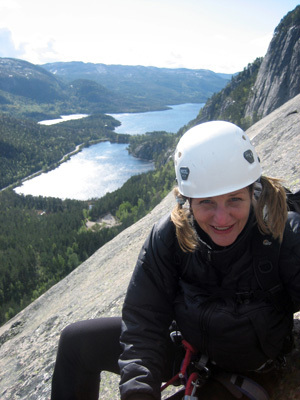 The Norwegian women needed a break and we thus grabbed the chance to get ahead of them on the real route. Elvira approximately halfway up the route. The river, wetlands and forest of the approach is seen below. The road and parking area is also visible in the upper right hand corner - if it was not for all the wet stuff the approach would thus be quite easy! I lead all the pitches which turned out to be very joyful climbing - mostly slabs with occasional cracks on excellent granite! Elvira reaching the end of the route. Quite typical for the routes in the area the routes become flatter (but also more run-out) at the top. The view over the landscape shaped by lakes, rivers, forest and mountains was just spectacular, but we didn't hang around for too long as we were anxious to find the walk-off before it got too late. Elvira enjoying the spectacular views from the summit. The walk-off was a big rightward turn on the back of the mountain, which turned out to be long and hard to follow. Initially, we followed cairns placed en route but they soon vanished and we were then left with our own intuition. To the right we had another big slab which we eventually found a route down, and then we obviously had to negotiate the river and wetlands again. This time we had to cross a dodgy looking wooden dam which luckily didn't crash while we crossed! Quite an adventure which we both enjoyed a lot. 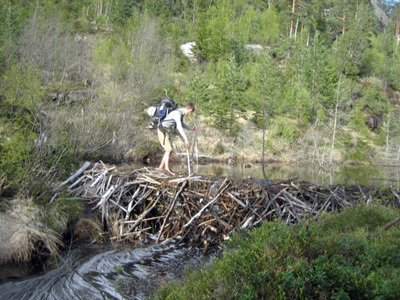 Hans negotiating the dodgy looking wooden dam. Does it hold? !